Flyball is a relay race with four dogs on a team. The racing “course” consists of a starting line, four hurdles spaced 10′ apart, and a flyball box. The first hurdle is 6′ from the start line and the box is 15′ from the last hurdle for a 51′ overall length. 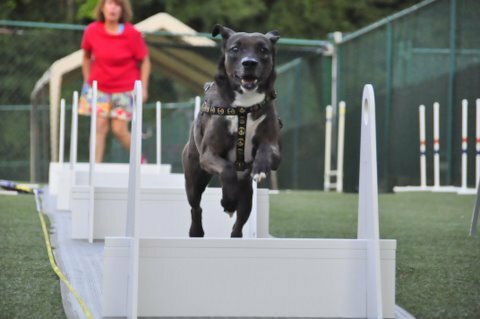 The hurdles height are dependent on the height of the dogs in the team — 5″ below the shoulder height of the shortest dog on the team determines the jump height for all the dogs on that team. 7″ is the minimum jump height and 16″ is the maximum height. The dogs jump the hurdles and step on a spring loaded plate on the box front, which shoots out a tennis ball. The dog catches the tennis ball and then runs back over the four hurdles. When the dog crosses the starting line the next dog on the team runs the course. The first team to have all four dogs run up & back without errors wins the heat. Tournaments are usually organized in either a double elimination or round robin format. Double elimination is usually best of three or best of five heats. Round robin is usually best three out of five and the first team to win three heats receives one point towards their standing in the tournament. Teams can place overall in the tournament by accumulating tournament points, by speed, or some combination of the two, depending on the structure of the tournament. Depending on how they place at a tournament, teams can also earn points towards regional championship titles.